My name is Lorena Baranda and I come from Palencia (Spain), the city where I was born and raised. 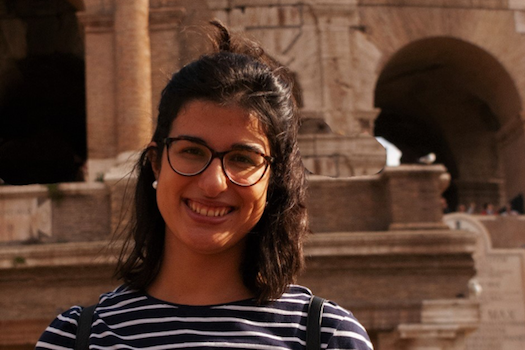 The reason you are reading about me today is because I am part of the 15 fortunate students who will be involved for 3 years in this research network, and I will be working at University of Rome Tor Vergata (Italy) in the Francesco Ricci Lab. As this is the first blog post, I would love to introduce myself, my background, and this exciting project that aims to develop nanorobots made of DNA! I come from a charming and pleasant town, to where I will always be linked to. Unfortunately, it is not endowed with many opportunities if your plan, like mine, is to pursue a scientific career. This fact together with my curiosity and traveling spirit brought me to leave my home at an early stage. Well, one of my first most determining decisions came up after finishing high school. The time to choose a career had arrived and it was scaring. To be honest, I did not feel convinced about my ultimate vocation – my dream job. I could not imagine the shape it would take. However, what I had completely clear in my mind was my authentic passion for science. This thirst for scientific knowledge brought me to develop a chemistry career in University of Valladolid. During those years, I gathered an understanding about the four main sub-disciplines involved in chemistry. I performed an intense work in organic chemistry, working on the molecular self-assembly of molecules for the construction of more complex architectures and also on the synthesis of hydrogels for tissue engineering applications. So, did you obtain a Master’s degree in organic chemistry? Not really, I had the chance to broaden my knowledge beyond pure chemistry, working in multidisciplinary fields such as nanotechnology, which really caught my attention. When the dimensions of matter are brought to the nanoscale, it exhibits an unusual behavior that does not follow the same laws that macroscopic objects do. Their characteristics change drastically, leading to enhanced properties, and this is what nanotechnology takes advantage of and really fascinated me. There are nowadays no doubts about nanotechnology’s potential to change our lives because it has revolutionized many sectors such as technology, energy, medicine, and environmental science. To me, it seems the limits are mainly set at the creativity of the researchers’ mind. There are countless ways of possible strategies, and every day new ideas are coming up. Feeling highly motivated by this promising area, I obtained a Master’s degree in Nanotechnology in University Rovira I Virgili (URV) in Tarragona (Spain) where I was trained in the fundamentals of nanoscience, nanofabrication, characterization techniques, and nanobiotechnology. Due to the partnership between URV and Northeastern University in Boston (USA) I did my Master’s thesis in a Nanomedicine Lab in Boston, working on the green synthesis of nanoparticles to fight antibiotic-resistant bacteria; an example of how nanomaterials can be used to improve our quality of life. I was immersed in this nanoworld and its use for therapeutic purposes, when I read about this ITN project and its aim to construct molecular machines made of DNA. Did I hear molecular machines? Yes, like in the movie Fantastic Voyage, but now this fiction is becoming real. Such nanomachines, which were the basis for awarding the Nobel Prize in chemistry 2 years ago, show advanced motion and are able to perform different tasks such as loading, transport, and release a variety of cargos at well-defined positions. Therefore, as you can imagine, their implementation can have a tremendous impact on our lives. Our objective with this project, is to develop these machines using DNA as a construction material. Wait… doesn’t that molecule store our genetic information? Why would you build anything with that? The high specificity and well-known interactions between DNA bases make this material a perfect element for nanoscale architecture. The use of artificial nucleic acids for technological uses led to the foundation of “DNA Nanotechnology”, which aims to explore the capabilities of DNA for technological uses rather than for carrying genetic information. OK, understood… and what will be the function of your molecular robot? Good question. The fact that this ITN brings together leading institutions, both universities and industries, with different expertise and 15 well-qualified students from diverse backgrounds will provide us with a huge range of possibilities. Taking advantage of this interdisciplinary environment, each of us will be in charge of developing a different function that will be later implemented on the final platform. In my case, I will be working on the sensing module. To end up this post, I wanted to share with you what are my expectations for the following years; to give my best within this project, to collaborate as much as possible with the other ITN members, to take advantage of all the partner institutions and the resources we are given and also to get to know them personally during secondments and schools, as well as enjoying the cities and all the people involved in this network! All in all, I want to grow and learn as much as I can from this experience.